Zubaida is popularly known as Zubaida Aapa. She is a famous Pakistani cooking expert and a chef. In addition, she is also a health and fitness expert. The remedies for weight loss and skin care advocated by her are very effective and loved by all. The cookery show hosted by Zubaida Tariq is very popular among women and girls. Her beauty tips, totkay and home remedies for hair, skin glowing and skin whitening, homemade tips to remove acne spots and scars on face, tips for fairness and dark spots on face and nose, dark circles under the eyes and weight loss natural tips, totkay and diet plan etc are also very famous. You should eat your food slowly. Never be in a hurry to finish eating. Chew the food for a long time and eat it slowly. This helps in burning more calories and you also get more benefits from the food you eat. Make sure that you chew each mouthful of food for at least 30 seconds. You should also pause for a while after eating food for 5 minutes. This pause is important because it takes about 10 minutes for your body to tell your mind that it is full. Green tea is also good for losing weight. Zubaida suggests that you have green tea regularly twice a day. It is better if you have it after lunch and dinner. Green tea has the power to burn body fat and extra calories. This way it helps in reducing weight. Grapefruit is also good for reducing weight. By eating half grapefruits daily half an hour before you have your meal, you will consume fewer calories. It also improves the metabolic rate, thereby improving your health. You will be able to reduce some pounds by consuming it. Lemon juice can help in providing you a slimmer body. All you have you have to do is to mix 3 tablespoons of lemon juice with 1 tablespoon of honey and ¼ tablespoon of black pepper powder and add them into a cup of water. Drink this thrice a day for minimum one month. You should include organic vegetables and fruits in your breakfast. Breakfast should be very healthy as it is the first meal of the day. It should be such that it can provide you enough energy to start your day. A healthy breakfast should include apples, peppers, tomatoes, carrots and no-fat yogurt. This is great for a successful weight loss. Make sure that you exercise regularly and have a healthy and balanced diet. This can help you lose weight effectively and stay fit. Do not depend on fat burning diet supplements alone or on medicines to lose weight. Instead, have healthy food and follow a good daily regime to lose weight. Take 4 glasses of water in a bowl and add 1 tablespoon of red lentils to it. Now you have to cook this till the water reduces to one glass. Transfer this into a glass and then place a steel spoon in the glass. Keep this glass in a place where there is cross ventilation and leave it overnight. Next morning, sieve the water and separate it from lentils and other debris. Add one pinch of black pepper and a few drops of lemon juice to tthis water and drink this mixture before you brush your teeth. Continue to drink this mixture every day for 40 days. You will see visible difference. Instead of taking heavy meals few times a day, break your meals into six parts. Remember to keep your lunch the heaviest of all meals. Typical and preferred timings for meals are 7.30 am, 10 am, 12.30 am, 4 pm, 6 pm and 9 pm. Tomato is wonderful for your health. Make it a habit to eat fresh tomato daily before breakfast. You will soon start noticing visible changes. Within a few weeks you will get positive results. Drink lots of water throughout the day. You should drink at least 8 glasses of water daily. As soon as you wake up in the morning, drink 16 ounces of normal to cold water. This way you can burn more than 100 calories per day. Foods containing lots of water have low energy density. So, they make you eat less. This way you will consume lesser calories. Soups are therefore very effective for reducing weight. They have high water content and fewer calories. This way you can lose weight effectively by consuming soups. Walking is the best exercise for you to stay fit and in good shape. Make it a habit to walk at least for an hour five days a week. This can help you lose weight. If possible, you can carry two dumbbells of 2 pounds each in your hands when you walk. 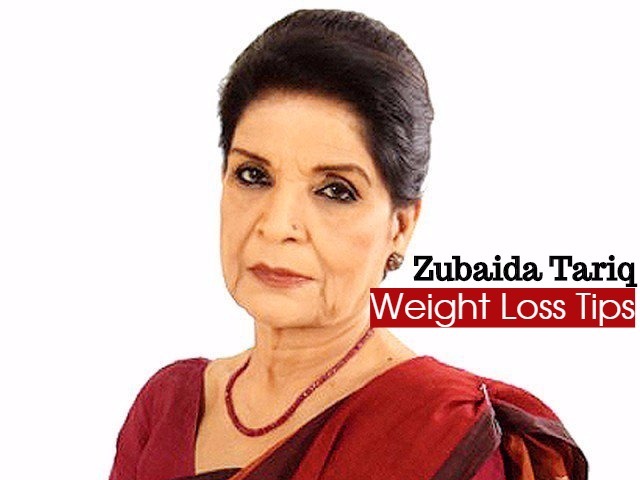 This is an important weight loss tip by Zubaida Tariq. Drink 5 glasses of warm water in the morning on an empty stomach. Then have your breakfast at 8 or 9 am. You can have brown bread, cottage cheese, apples and low-fat milk for breakfast. after two hours you can eat skimmed yogurt. According to her method, you have to eat something every two hours till night. Do not consume rice or bread. Climb and descend the stairs at your home. Walk as you hold your belly inside. Within a month you will feel the difference.